Let’s cut right to the chase, shall we? Tron: Legacy is a worthy successor to the original Tron. Unfortunately, the original Tron was a complete snooze-fest that would have been a footnote in the annals of Disney history, were it not for its interesting visuals and the fact that it was one of the earliest films to take full advantage of the then-burgeoning computer technology. The first film is a better memory than it is a movie. I suspect this is something Disney is painfully well aware of, as evidenced by the fact that it’s currently unavailable on DVD. In the original, software engineer Flynn (Jeff Bridges) is sucked into a computer world where he and his friend Alan (Bruce Boxleitner) are forced to battle to the death in a series of gladiator style high-tech games. Bridges and Boxleitner also play Clu and Tron (respectively). Clu and Tron are physical representations of computer programs that each had written. Together they lead an uprising against the computer program they’ve been locked inside of. Tron: Legacy picks up the story 28 years later. Flynn, after becoming a legendary computer programmer, has been missing for years. Meanwhile his son Sam (Garrett Hedlund) is an unwilling heir to his computer empire ENCOM. Sam believes that information should be free and has nothing but disdain upon discovering that the ENCOM is planning to *gasp* charge people for their new operating system. As an act of civil disobedience, our hero leaks the software on to the internet before the company can actually sell any copies. Based on how security treated me and my cell phone at the screening, I’m assuming Disney love of internet leaks applies exclusively to operating system software and not movies. But I could be mistaken. It’s not long before Sam, in a quest to find his missing father, is sucked into the computer himself. From here on out, it’s a muddled mess. Sam finds his father and fights to save…or maybe stop…um, Clu from…aw hell, I don’t know. There’s light-cycles and stuff. They kill each other with Frisbees. I have no idea what any of it means or why we should care. And there are numerous head-scratching conundrums. For instance, each character in this world represents a computer program (or part of a computer program), so why do we see them eating and drinking? And whatever is going on in this world is supposed to pose a great danger so, um, why didn’t Flynn just unplug the damn thing when he got out the first time? Oh, and this computer is almost 30 years old. It has to have like about 3MB of RAM. By today’s standards this thing should be about as menacing as a digital watch. And if Flynn has been trapped in this world as digitized version of himself, why has he aged? The character of Clu, also played by Bridges, has been digitally altered in order to make him look the same as in the original film. Quite frankly, it’s horrible. While technology has gotten closer than ever before to recreating an actor, it’s still not quite there. Clu looks more like someone has inserted a character from a video game into the film. And honestly, that could have been an interesting conceit. But if that was the filmmakers’ intent, then every other character in this world should have shared that same look. Sadly, none of them do. Even the look of the film is held back by the fact that they are limited to the set designs of the first film. So while this world is rendered with better technology it doesn’t really feel appreciably different. Compounding problems is that, once again, Hollywood has foisted 3D upon us for no apparent reason whatsoever. It adds nothing to the film and just makes an already dimly lit film even dimmer. 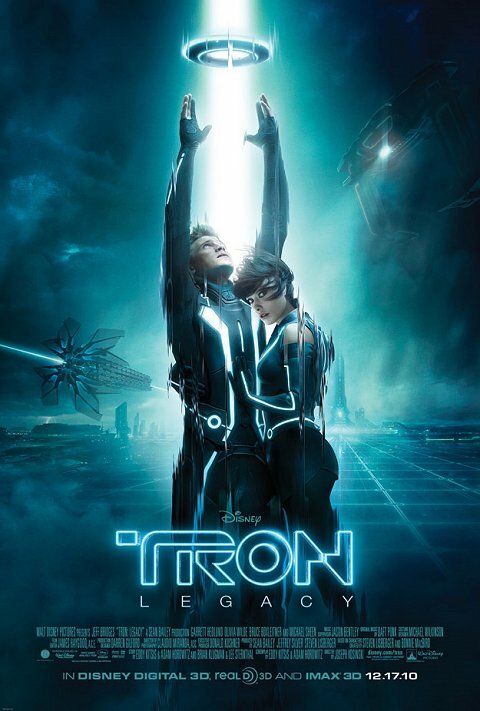 On a scale of 1 to 10, with 10 being Scott Pilgrim vs. the World and 1 being Super Mario Bros., Tron: Legacy gets a 3.